One of our museum clients built a 100m long, 23m diameter glacier ice cave with real ice…inside! How do they use it with visitors? How do you use domed theaters for art history talks? Kinects are discontinued…what to use now. How do you know when to use an LED wall? What pixel pitch? Tired of buttons and touchscreens? Want the coolest interactive input method with complete realtime video speedup/slowmo control? Eight workshops with internationally respected specialists in their fields. 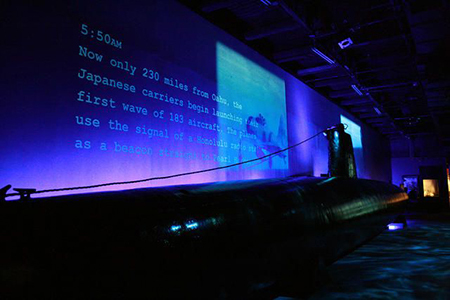 Want to create memorable immersive experiences? On February 28, 2018, Bowen Technovation will host another of our very unique exhibit and immersive theater design meetings. We are inviting administrators and exhibit designers from museums, science centers, architectural and exhibit design firms, cultural/nature center/state park staff, planetarium managers/technicians, etc. A Certificate of Completion will be included. The most important part of the seminar is a full day of detailed workshop sessions by BT staff and personnel from major manufacturers. Attendees receive an unsurpassed level of useful information. The nation's major audio-video-lighting-control equipment/software companies will have representatives and product at the event. A classroom setting will allow BT staff and invited industry specialists to conduct classes focusing on new technologies as they relate to exhibit and presentation systems. A workbook will be handed out. These are intended as professional development workshops, not sales pitches, and will include classes on a variety of topics. 8:30-9:00 Welcome Session. Schedule Changes. Refreshments sponsored by Bowen Technovation and Barco. 9:00-9:40 Workshop W-1 ● "New LED and Flat Panel Video Wall Displays"
9:45-10:25 Workshop W-2 ● "Design...Great Exhibit Idea!...Now What?" 10:30-11:10 Workshop W-3 ● "Digital Video and Audio Ideas for Exhibits"
11:15-11:30 Break sponsored by Astro-tec. See BT equipment samples. 11:30-12:10 Workshop W-4 ● "RIP Lamps…New Projector Technologies"
12:15-1:00 Workshop W-5 ● ""Interactives… New Visitor Input Methods… Real Time? Really?" 1:00-2:30 Lunch sponsored by Planar. Look thru BT and manufacturer equipment samples in the Classroom. 2:30-3:10 Workshop W-6 ● "How to Design a Modern Immersive Theater or Immersive Exhibit"
3:15-3:45 Workshop W-7 ● "Can You Repeat the Question?" 3:50-4:30 Workshop W-8 ● "Master Control Systems for Multiple Exhibits"
4:30-4:45 End of Day Notes. Door Prizes. 4:45-5:00 Head to domed theater or meet with product experts in the classroom. 5:00-6:00 Fantastic domed theater presentation in the 60-foot COSI dome. Presented by Ty Owen. Welcome Session. Schedule Changes. Refreshments. "New LED and Flat Panel Video Wall Displays"
LED video walls are the hot item in 2018. Do you need 4K? What size display? LED? LCD? OLED? What new products are around the corner? Sit in on this workshop to find out. New technology LED video walls will be used in this session. Everyone has great ideas for exhibits. The challenge is in translating great ideas into great exhibits. Creative and organized are fully compatible ideas. This session explores how exciting and engaging exhibits are created using an organized methodology including: Planning, Budgeting, Design, Evaluation, Fabrication and Installation. Case studies include Knock, Knock Children's Museum (Baton Rouge). "Digital Video and Audio Ideas for Exhibits"
What is "true" networked video and audio over real IP? When do you use it?? How is it more flexible and how does it save $$ over other methods. What is Dante digital audio? Various types of equipment and installation methods are discussed. 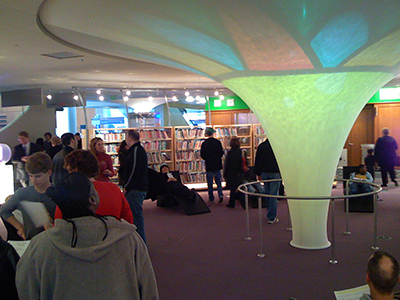 Case studies include the Northwest Mutual Identity Center and various planetarium projects. Panelists: Mark Trotter (Bowen), Shaun Burnette (Atlona). Sponsored by AstroTec Manufacturing. Astro-Tec Manufacturing, Inc. is recognized around the world as the leader in design and manufacturer of domed and curved perforated projection screen equipment. Astro-Tec was incorporated in 1963 and now has developed the most advanced seaming technology in the world for perforated aluminum projection surfaces. The projection industry has revolutionized in the past few months. 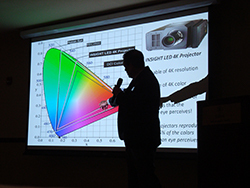 Top engineers in this industry will discuss how to select projectors as well as discussing new lamp-free long-life LED and laser light projectors. Case studies include the new Perlan Nature Museum (Iceland) and several immersive theater installations by Bowen staff. Buttons, motion sensors, touchscreen exhibits, touch video walls, touch tables, multitouch, outdoor...How to decide which method to use with? How do you know how to select one over the other? Case study includes video of Orangutans using touchscreens at the International Orangutan Center and visitor interactives at the Gerald Ford Presidential Museum. Sponsored by Planar. Planar's commitment to high quality, leading-edge display technology is unparalleled. With innovations in video walls, large format displays, and touch interactivity, Planar offers terrific visualization solutions for a variety of demanding vertical markets around the globe. Planar products are featured in many Bowen installations that are discussed in today's workshops. "How to Design a Modern Immersive Theater or Immersive Exhibit"
So, you are thinking of adding a planetarium/immersive theater to your place. This workshop details the start-to-finish process of designing, bidding, installing and staffing a domed or curved screen immersive theater with applications for immersive experiences in astronomy, earth sciences, local history, art history archaeology, mythology and storytelling. 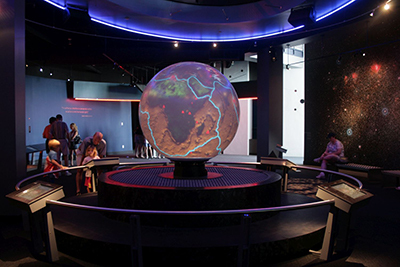 Case studies include the new University of Michigan Museum of Natural History and Embry-Riddle Aeronautics University Planetariums. "Can You Repeat the Question?" During tours and other live presentations (such as in domes) it is often difficult for audience members AND panelists to hear audience questions without shouting above acoustics or general visitor noise. We will demonstrate new reusable systems that solve this problem with minimal fuss and cost. This features a new product just now hitting the street! "Saving Footsteps… Master Control Systems for Multiple Exhibits"
All exhibit systems need to be controlled, even it is just to start playing a video when turned on. Very simple locally-based interactive and automated control of exhibit audio-video-lighting is explored using very simple methods and well as global museum wide master control systems with docent overrides and automated daily startup/shutdown. See how a dome theater can be used not only for spectacular science visualizations, but also can be canvas for high-energy, revenue generating public shows. This features COSI VJ (video-jock) Ty Owen.